The Lodge was warranted on 3rd December 1755, as No. 43 of the Antients. The Warrant was renewed on 24th June 1776 on the payment of six shillings. The Moderns Warrant was obtained on May 4th 1785, as No. 471, the W.M. being John Wilson. The Antients Warrant was cancelled on 5th June 1793. Subsequent changes of the Lodge Number were as follows:. 1792-382; 1814-476; 1832-316; 1863-254. The Centenary Warrant was granted in 1885. The Bi-Centenary Warrant was granted in 1955. 1755 'Golden Lion', Bull Ring. 1761 'Bird in Hand', Little Park Street. 1762 'Rose and Crown Inn, High Street. 1785 'Golden Lion', Bull Ring. 1804 'Bull and Anchor', Bishop Street. 1806 'Spotted Dog', Bull Ring. 1808 'George Inn', Little Park Street. 1876 'Craven Arms', High Street. 1905 'Masonic Hall', Little Park Street. 1975 'Drapers Club', Warwick Road. * Known from 1999 as 'Coventry Masonic Hall'. The roots of Trinity Lodge 254 can be traced back to 1755. You can view the full tree by clicking on the image opposite. You can also find a list of the Past Masters and read some of their biographies. Click here to open the Family Tree (pdf format). One of the great privileges accorded to the Worshipful Master of Trinity Lodge is the right to sit in this magnificent Master's Chair. This ornate and impressive chair has been in regular use for over two hundred years but its date of origin and its arrival in Trinity Lodge is a conundrum on which we can only speculate. It Nearly Did Not Happen! The independence of Trinity Lodge from higher authority was exemplified by events surrounding the celebration of the Bi-Centenary held at the Matrix Hall, Coventry. 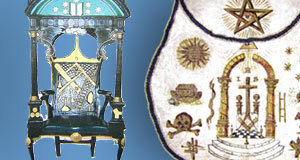 The history of Trinity Lodge 254 and many of it's Past Masters is intertwined with the history of the City of Coventry. We would be pleased to learn more and if considered appropriate, we will be happy to add the information regarding any Past Master to this website.